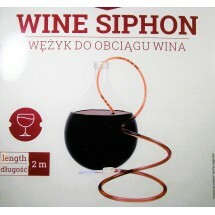 Specially for the fermentation of high alcohol wines. Ferments consistently, even at lower temperatures, with low residual sugar. Very good results with Pinot Gris and Chardonnay wines. Ideal for secondary fermentation and for sparkling wines or for restarting a stopped fermentation. 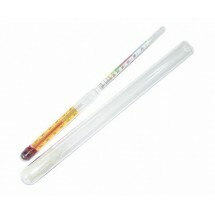 Wide temperature range: 10-30 °C. Alcohol tolerance: 16 % vol. 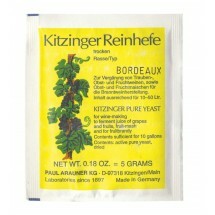 Contains the 'killer' factor to inhibit wild yeasts. 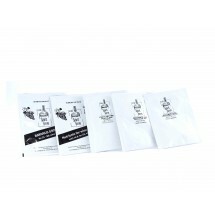 Dosage: 2 g/10 l whith temp. > 15 °C. 3 g/10 l whith temp. < 15 °C. 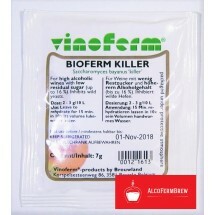 Alcohol Meter + Thermometer + Glass JarThermometer: -20 - 40°CScale: 0 to 100%Lenght: 24cmThis speci..
WINE YEASTActive Wine Yeast for All purpose wine: All purpose red, All purpose white, Bordeaux White..
KITZINGER PURE ACTIVE YEAST - BORDEAUXIn packs of 5 g, sufficient for max. 50 litresFor wine-making ..